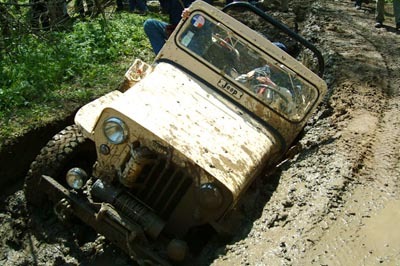 Every 4x4 magazine has its page of photos of vehicles stuck in the mud, so why not on CJ3B.info? Of course, the first thing people think of when they get stuck, is not usually whipping out the camera for a nice photo, especially when they're miles from home at dusk. So I don't get a lot of these photos, but I've collected a few, so here they are. Fernando de Luca of the Asociacion Argentina de Coleccionistas de Vehiculos Militares navigates a small river in his M606, at the AACVM event at Salida Carmen de Areco, in May 2002. 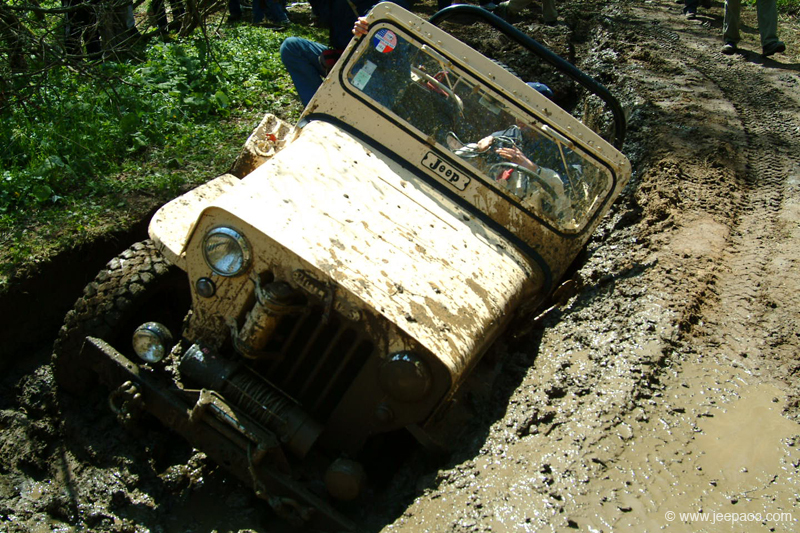 Mike Krueger in Ohio got his 1954 CJ-3B stuck in a set of monster truck ruts. But he says this doesn't happen very often. Wearing 33/9.50R15 tires, she's "a very unassuming Jeep until she is on the trail and then she just embarrasses most of the well-built trail vehicles." "Escuadron Fighter" is a group of civilian pilots from the Aerial Club of Santiago, Chile who also enjoy land expeditions to remote and difficult locations. And they love to take lots of pictures on their trips. Their vehicles include a Unimog truck, an M151 MUTT, and a couple of CJ-3Bs. This photo of a 3B in the snow was taken on their expedition to Quinquén, the "hidden valley." From the same expedition, see a front view of this 3B (30K JPEG), and a photo of the other 3B leading the Escuadron on the trail (50K JPEG). The same CJ-3B found itself in the mud on the Escuadron's expedition to Cajon de Maipo. The photographer says: "The commander gave orders that the Jeep be moved, and there were some who sacrificed themselves...."
See also the CJ-3B beside the Unimog (20K JPEG). Elsewhere on the web, see the complete photographic story of the Escuadron's Expedition to Quinquén and their Expedition to Cajon de Maipo. 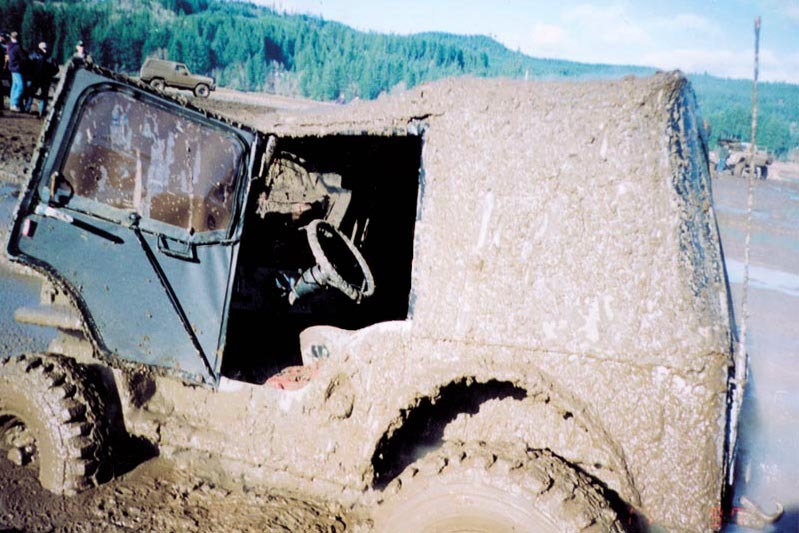 At the opposite end of the Americas, here's a CJ-3B in an even worse spot, seen on JeepAlaska.com. A guy named Moe apparently got himself in a little too deep when he was out moose hunting. This is a photo you may have seen before, of JC Jenkins' Killer B on the Rubicon in 1998. JC comments, "Here's another shot of the 3B, stuck in what is known as the 'dogleg.' The Jeep is resting on the driver's rocker panel, putting a dent in it, but that's OK, the rock is the only thing stopping the Jeep from tipping over. With a chain from the Jeep in front, we were able to climb out. This stuff is not for the faint of heart or inebriated." The oldest photo on this page shows a CJ-3B during a 1954 demo for the Swedish Army at the Scania-Vabis test track in Sodertalje, Sweden. Hard to know if the guys in the hats are government agents or Jeep salesmen. The photo comes from Jeepbladet , the magazine of the Willys Jeep Klubb in Sweden. Soft shoulder: a Jeep Hotchkiss JH-102 in a sticky situation at Chambon sur Jeep 2006, a rally of 350 Jeeps in Auvergne, France in April 2006. Photo courtesy of the JeepAOC club. How about this for camo? The owner of this 3B, who wishes to remain anonymous, used its V8 power to apply the new color scheme. Cloves Ferreira in Rio de Janeiro, Brazil (his friends call him Duda) sent this photo of his GM 151 4-cylinder powered CJ-3B in the mud. The power steering and 33-inch tires didn't get Duda through this hole. Also on CJ3B.info, see Jason McBride get stuck when he goes Back in the Mountains With Dad's Jeep. And see CJ-3Bs at the Mud Races. Return to the Index of Unusual Photos on CJ3B.info.